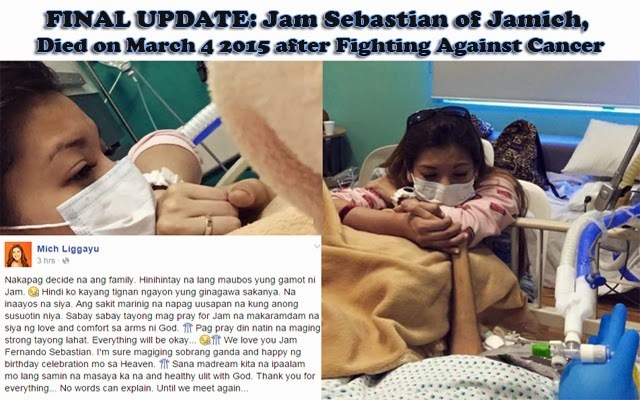 Condolences and prayers flooded JaMich’s Facebook page as news of the passing away of Jam Sebastian on March 4, 2015 at around 10:30 AM had been announced by his mother, Maricar Fernando Sebastian. Jam, the half of the YouTube sensation JaMich, had been on life support since February 27, 2015, which prompted many to rally prayers for his recovery. The hopes of family and friends had been lifted when he had gained consciousness and was even able to write his messages because the tube of the ventilator didn’t permit him to talk. It had been on of March 3 when Michelle Liggayu shared that Jam’s condition had worsened. He once again became unconscious and his vital signs were getting low. This prompted them to their decide to let Jam finally go. Mich shared the pain of seeing her fiance in his bed, being propped by the medical staff. They decided to just wait until the last of the available medications had been given and Jam peacefully pass away. She also shared the feeling of hearing people talk about the plans for Jam’s burial such as the clothes that he will wear. Mich also posted her prayer that Jam would finally feel the love and comfort in the Creator’s hand. Sharing her wish that she would dream of seeing Jam healthy and happy once again, Mich finally bid farewell to her sweetheart both onscreen in internet and in real life. In the end, Mich shared that she is being consoled that Jam will not be in pain any longer. It was earlier last year when Jam revealed his health condition. His fans, family and friends had showed support and love for him. His older brother, Yexel Sebastian, uploaded a video thanking those who had prayed with them and showed support to his younger brother.